I won’t take much of your time, because I know many of you are trying to catch up on your reading to finish the Book of Mormon today. Moroni 10 contains the prophet Moroni’s final words before he sealed up the record to be brought forth by the gift and power of God. About 1,400 years before Joseph Smith received the gold plates, Moroni concluded his father’s record by writing some final exhortations to those who would receive the Book of Mormon in the last days (see Moroni 10:1–2). The word exhort means to urge, advise, caution earnestly, admonish urgently. Moroni used the word nine times in the final chapter of the Book of Mormon. Moroni’s first exhortation can be found in Moroni 10:1–2, and “I would exhort you” to look for the remaining exhortations that Moroni felt inspired to include in this final chapter and consider which one applies to you and your current situation in life. Perhaps the most well know exhortations extended by Moroni are those found in Moroni 10:3-5. These verses have always meant a lot to me. I have a burning witness of the veracity of the Book of Mormon. Well, what can I say to that? That was one of the most exciting moments as a parent that I had experienced up to that point. He is now 12 and has read the Book of Mormon almost every day (on his own) since he first finished it. He has completed it several times since then and continues to affirm its truthfulness and helpfulness in his life (He is currently studying the Old Testament). His sister followed his example and also read the Book of Mormon in the year preceding her baptism and continues to read it personally on a daily basis. She is completing it for the third time on her own as part of The Book of Mormon Translation Challenge. My next oldest (our third child) is currently reading the Book of Mormon to help him prepare for his baptism in August. He reads at least 15 verses a day in an effort to finish his study by then. I have three other young children that I pray will follow the example of their older siblings. And now my beloved blog-buddies, “I would exhort you” that when you have finished studying the Book of Mormon as part of the Book of Mormon Translation Challenge, that you would “go back to the Book of Mormon and drink deeply and often” because, “great faith has a short shelf life” (“Spiritual Preparedness: Start Early and Be Steady“, Ensign, Nov. 2005). And to those of you who may not have finished reading the Book of Mormon by June 30, “I would exhort you” to remember that it is the direction that you are headed and not the speed that is important on this journey to study the Book of Mormon. Finally, THANK YOU! Thank you for accepting the challenge to read the Book of Mormon in the time that it took Joseph Smith and Oliver Cowdery to translate it. Thank you for making time in your busy schedules to study this holy book–Another Testament of Jesus Christ. Thank you for sharing your comments on this blog and on our Facebook Page/Group. Thank you for inviting me into your life to share my thoughts and excitement for the Book of Mormon with you. PLEASE leave a comment at the bottom of this post (or our Facebook Page or Facebook Group) letting me know that you FINISHED studying the Book of Mormon. I would like to add your names to the list on this blog of those who completed the Book of Mormon Translation Challenge. The Book of Mormon is a book with a promise. Although its history is compelling by itself, it is a book of scriptural significance that should be received and read under the influence of the Holy Ghost. Moroni 8 is an epistle Mormon wrote to his son Moroni about why little children do not need baptism. In the epistle, Mormon also taught about how we can prepare to dwell with God. He concluded by expressing concern for the wickedness and impending destruction of the Nephites. Moroni 9 contains Mormon’s final recorded epistle to his son. He expressed sorrow for the wicked state of the Nephites and urged Moroni to labor diligently to help the Nephites repent. Notwithstanding the corrupt situation of his people, he encouraged his son to be faithful in Christ and to let the promise of eternal life rest on his mind forever. It is interesting to note that with both of the difficulties addressed in Moroni 8 & 9 (doctrinal and moral issues), the solution that Mormon shared with Moroni was the same: “LABOR DILIGENTLY” (Moroni 8:6 & 9:6). What great advice! It seems like the call to “labor diligently” is the solution for not just addressing doctrinal and moral issues, but just about any issue that we will face in life. So many times we let worry and stress rob us of our strength. Why don’t we just “labor diligently” and address the issues head on? With each passing day we draw nearer and nearer to the Second Coming of our Savior Jesus Christ. And even if we don’t have any doctrinal, or moral, or persaonl issues we are facing right now, if we “labor diligently” we will be blessed to meet Him some day. Recently the Church has faced some serious scrutiny in the media for it’s stance on certain doctrinal and moral issues as well. As I have read the information coming from both the media and the church, I have reflected on two scriptures from Doctrine and Covenants section 1 (which is the Lord’s own “preface” to this modern book of scripture). I invite you to consider how they relate to each of the epistles that Moroni included from his father, and how they relate to the current events involving the Church in the media? It is interesting to me that just yesterday, Church leaders published their own “epistle” to us. I am go grateful that the Lord blesses us with living prophets to guide us in our day. I know that they are called of God and are seeking to do His will. You may have already seen this statement being distributed throughout social media. But whether you have read it or not, I invite you to study it closely and consider the message that our Loving Heavenly Father and our Redeemer Jesus Christ are sending to us. I know that if we “labor diligently” to apply D&C 1:38 that we will never fall victim to D&C 1:14 (as the people did in the closing chapters of the Book of Mormon). In God’s plan for the happiness and eternal progression of His children, the blessings of His priesthood are equally available to men and women. Only men are ordained to serve in priesthood offices. All service in the Church has equal merit in the eyes of God. We express profound gratitude for the millions of Latter-day Saint women and men who willingly and effectively serve God and His children. Because of their faith and service, they have discovered that the Church is a place of spiritual nourishment and growth. We understand that from time to time Church members will have questions about Church doctrine, history, or practice. Members are always free to ask such questions and earnestly seek greater understanding. We feel special concern, however, for members who distance themselves from Church doctrine or practice and, by advocacy, encourage others to follow them. Simply asking questions has never constituted apostasy. Apostasy is repeatedly acting in clear, open, and deliberate public opposition to the Church or its faithful leaders, or persisting, after receiving counsel, in teaching false doctrine. Do you see what I mean? That is not “milk” of the gospel type stuff; that is serious “meat and potatoes” gospel stuff. Sure, it may seem common place to us, BUT that is only because Moroni put it there in the first place and we have known it all of our lives! Sometimes we don’t realize the value of what we have because we have always had it. But what we are really looking at in these chapters is what Moroni knew was essential, and he knew that these essentials were not yet found in the Book of Mormon. Indeed they are just as Moroni had hoped–they have been, and are, of great “worth” (Moroni 1:4). Let me illustrate how these seemingly common-place teachings helped to bring about the marvelous restoration of Christ’s true church. 2 Behold, I have manifested unto you, by my Spirit in many instances, that the things which you have written [the Book of Mormon and the revelations that have preceded D&C 18] are true; wherefore you know that they [the Book of Mormon and the revelations that have preceded D&C 18] are true. 4 For in them [the Book of Mormon and the revelations that have preceded D&C 18] are all things written concerning the foundation of my church, my gospel, and my rock. So, here is what happened… In D&C 18:1-5, Oliver was “commanded” to take an active roll in creating the Articles and Covenants of the Church (D&C 20) by “rely[ing] upon the things which are written” in the Book of Mormon and the revelations that preceded D&C 18. Now what parts of the Book of Mormon match up best with D&C 20? In the true in the spirit of discovery and seeking learning by faith, you may want to take a break from this post and STUDY Moroni 2-6 AS IF YOU WERE OLIVER and had been “commanded” by the Lord to “rely upon the things which are written” to figure out how to orginize the Church. As you do so, I would recommend that you MARK anything that stands out to you. Once you have done that, go to D&C 20 and look for the elements that you discovered in Moroni 2-6. I would encourage you to write the Book of Mormon references that you discovered with their companion scriptures in D&C 20. After my first read I found eight references in Moroni 2-6 that are directly correlated to companion scriptures in D&C 20. I am sure that there are more. See what you can discover for yourself! So, these chapters seem to have been originally intended to be of “worth” to the restoration of the Church of Jesus Christ in the latter-days. However, as I mentioned before, we can also see these chapters as a Personal Handbook of Instructions. Now I know that Moroni’s intent in writing these chapters is not to be a handbook for how to never be alone. All I am doing is “likening” what is found in these chapters to things that they Lord has given us to help us never feel alone… even when we are. Once again, in the spirit of discovery and seeking learning by faith, STUDY what is found in Moroni 1-7 and find what can help you to understand that you never have to feel alone when you live the gospel. This time you really will have to be like Oliver Cowdery, because there will be no supporting document to show you the right answers. You can do it! “Rely upon the things which are written,” and find what the Lord has given you in each of these chapters so that you never have to be alone. There is a LOT of bad stuff that happens in Ether 13-15, and most of it is not very fun to read about. The prophet Ether Coriantumr, a Jaredite king, that his people would be destroyed because of wickedness, and he admonished Coriantumr and his household to repent. When Coriantumr and the people refused to repent, war and wickedness escalated for many years until the entire Jaredite nation was destroyed. Only Ether and Coriantumr survived to witness the fulfillment of Ether’s prophecy. New Jerusalem is mentioned in each of the books of scripture used by the Latter-day Saints–Old Testament, New Testament, Book of Mormon, Doctrine and Covenants, and the Pearl of Great Price. In order to get a good understanding of New Jerusalem it is important to see what each book teaches about this holy city. Where I find real relevance and immediate personal application for New Jerusalem–the City of Zion–is in the plat that was created by Joseph Smith for the organization of the holy city (History of the Church, Vol. 1 Chapter 26 [June 1833- July 1833]). This plat became the model for the early Saints as they built their settlements. At the center of New Jerusalem there are several temples. Everything in the city is built around and focused on the temple.The temple is a symbol of the Savior. 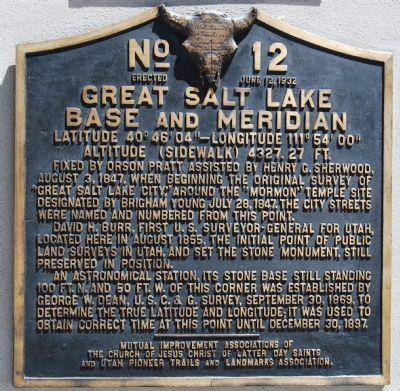 When the Mormon pioneers arrived in the Salt Lake Valley after their epic journey across the continent, and Brigham Young proclaimed that “Here we will build a temple to our God” in 1847, it was at this exact spot [Base & Meridian stone]. A stake was placed into the ground immediately and it became the anchor for the LDS headquarters and all of their activities thereafter. This same method also allows me to find my way to the temple by simply reversing the cardinal directions of any address. If I am at Rice-Eccles Stadium (451 S 1400 E, Salt Lake City), then I just need to travel four-and-a-half blocks North and then 14 blocks West. Have you ever noticed what is on the cover of each of the booklets prepared for latter-day youth? The temple is on the cover of the For the Strength of Youth, Personal Progress, and Duty to God booklets. Once again, the temple is a symbol of the Savior. The City of New Jerusalem “sets forth an orderly pattern intended as an earthly reflection of the ideal religious community” (Far West Plat Reflects Inspired City Plan) as well as a pattern for a Christ-centered life. THE SAVIOR IS AT THE CENTER! Those who will build their lives around the temple will find that they have centered their lives on the Savior. They will be citizens of New Jerusalem before it is built and they will receive the wages of the “laborer in Zion“. IF you watch this film about the last battle of Coriantumr and Shiz, you will notice a content-error at the end. Understandably, it was probably an intentional artistic edit to increase the drama of an already dramatic battle. ON THIS DAY IN 1844: 170 years ago today, the Prophet Joseph Smith, and his faithful and beloved brother, Hyrum Smith, were martyred at Carthage Jail. May we honor their lives by living our lives the best we can today! PRAISE TO THE MAN! It is somewhat surprising and interesting that the book of Ether does not introduce the prophet Ether until chapter 12 (of 15). It is only after recounting many years of Jaredite history that Moroni introduces the ministry of the prophet Ether. After just a few verses (Ether 12:1-5) Moroni then pauses in his historical account and records some of the blessings that come to those who exercise faith in Jesus Christ (Ether 12:6-22). In humble prayer, Moroni expresses a concern. He worries about the weakness he perceived in his writing and in the writing of other Book of Mormon prophets. The Lord promised Moroni that He strengthens the weaknesses of all those who humble themselves before Him and have faith (Ether 12:27). BUT, I can’t let you off the hook that easily–especially when we only have a couple more days left in the Challenge! So here are some insights on FAITH from Elder David A. Bednar. If you have never seen the graphic below, it is one that you are going to want to dedicate to memory or save digitally. It is simple, and yet mind-blowing once Elder Bednar explains and expounds upon it. Are you interested? Then read on and see how it augments your study of Ether 12! We are admonished repeatedly in the scriptures to preach the truths of the gospel by the power of the Spirit (see D&C 50:14). I believe most parents and teachers in the Church are aware of this principle and generally strive appropriately to apply it. As important as this principle is, however, it is only one element of a much larger spiritual pattern. We are also frequently taught to seek learning by faith (see D&C 88:118). Preaching by the Spirit and learning by faith are companion principles that we should strive to understand and apply concurrently and consistently. I suspect we emphasize and know much more about a teacher teaching by the Spirit than we do about a learner learning by faith. Clearly, the principles and processes of both teaching and learning are spiritually essential. However, as we look to the future and anticipate the ever more confused and turbulent world in which we will live, I believe it will be essential for all of us to increase our capacity to seek learning by faith. In our personal lives, in our families, and in the Church, we can and will receive the blessings of spiritual strength, direction, and protection as we seek by faith to obtain and apply spiritual knowledge. Nephi teaches us, “When a man speaketh by the power of the Holy Ghost the power of the Holy Ghost carrieth [the message] unto the hearts of the children of men” (2 Nephi 33:1). Please notice how the power of the Spirit carries the message unto but not necessarily into the heart. A teacher can explain, demonstrate, persuade, and testify, and do so with great spiritual power and effectiveness. Ultimately, however, the content of a message and the witness of the Holy Ghost penetrate into the heart only if a receiver allows them to enter. Learning by faith opens the pathway into the heart. These teachings highlight three basic elements of faith: (1) faith as the assurance of things hoped for that are true, (2) faith as the evidence of things not seen, and (3) faith as the principle of action in all intelligent beings. I describe these three components of faith in the Savior as simultaneously facing the future, looking to the past, and initiating action in the present. Faith as the assurance of things hoped for looks to the future. This assurance is founded upon a correct understanding about, and trust in, God and enables us to “press forward” (2 Nephi 31:20) into uncertain and often challenging situations in the service of the Savior. For example, Nephi relied upon precisely this type of future-facing spiritual assurance as he returned to Jerusalem to obtain the plates of brass—“not knowing beforehand the things which [he] should do. Nevertheless [he] went forth” (1 Nephi 4:6–7). Faith in Christ is inextricably tied to, and results in, hope in Christ for our redemption and exaltation. And assurance and hope make it possible for us to walk to the edge of the light and take a few steps into the darkness—expecting and trusting the light to move and illuminate the way. 2 The combination of assurance and hope initiates action in the present. Faith as the evidence of things not seen looks to the past and confirms our trust in God and our confidence in the truthfulness of things not seen. We stepped into the darkness with assurance and hope, and we received evidence and confirmation as the light in fact moved and provided the illumination we needed. The witness we obtained after the trial of our faith (see Ether 12:6) is evidence that enlarges and strengthens our assurance. Assurance, action, and evidence influence each other in an ongoing process. This helix is like a coil, and as it spirals upward it expands and widens. These three elements of faith—assurance, action, and evidence—are not separate and discrete; rather, they are interrelated and continuous and cycle upward. And the faith that fuels this ongoing process develops, evolves, and changes. As we again turn and face forward toward an uncertain future, assurance leads to action and produces evidence, which further increases assurance. Our confidence waxes stronger, line upon line, precept upon precept, here a little and there a little. BRO SIMON SAYS SIDEBAR: When I teach this, instead of using the word “Action” I replace it with the word “Work”. Then the pattern creates the acronym, “A.W.E.” (Assurance, Work, Evidence), and I call it a lesson about How to Have “A.W.E.some Faith”! We find a powerful example of the interaction among assurance, action, and evidence as the children of Israel transported the ark of the covenant under the leadership of Joshua (see Joshua 3:7–17). Recall how the Israelites came to the river Jordan and were promised the waters would part, and they would be able to cross over on dry ground. Interestingly, the waters did not part as the children of Israel stood on the banks of the river waiting for something to happen; rather, the soles of their feet were wet before the water parted. The faith of the Israelites was manifested in the fact that they walked into the water before it parted. They walked into the river Jordan with a future-facing assurance of things hoped for. As the Israelites moved forward, the water parted, and as they crossed over on dry land, they looked back and beheld the evidence of things not seen. In this episode, faith as assurance led to action and produced the evidence of things not seen that were true. “For as the body without the spirit is dead, so faith without works is dead also” (James 2:26; emphasis added). 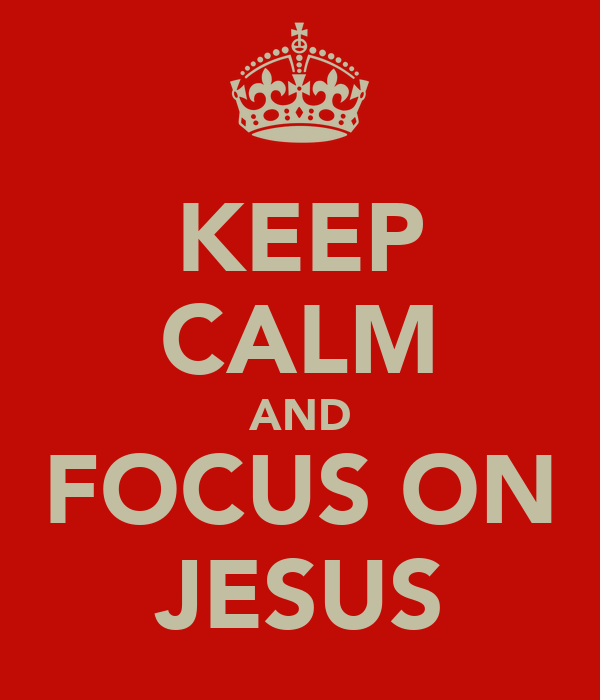 “But be ye doers of the word, and not hearers only” (James 1:22; emphasis added). “Awake and arouse your faculties, even to an experiment upon my words, and exercise a particle of faith” (Alma 32:27; emphasis added). And it is faith as the principle of action that is so central to the process of learning and applying spiritual truth. How is faith as the principle of action in all intelligent beings related to gospel learning? And what does it mean to seek learning by faith? In the grand division of all of God’s creations, there are things to act and things to be acted upon (see 2 Nephi 2:13–14). As sons and daughters of our Heavenly Father, we have been blessed with the gift of agency—the capacity and power of independent action. Endowed with agency, we are agents, and we primarily are to act and not only to be acted upon—especially as we seek to obtain and apply spiritual knowledge. Learning by faith and from experience are two of the central features of the Father’s plan of happiness. The Savior preserved moral agency through the Atonement and made it possible for us to act and to learn by faith. Lucifer’s rebellion against the plan sought to destroy the agency of man, and his intent was that we as learners would only be acted upon. Consider the question posed by Heavenly Father to Adam in the Garden of Eden: “Where art thou?” (Genesis 3:9). The Father knew where Adam was hiding, but He nonetheless asked the question. Why? A wise and loving Father enabled His child to act in the learning process and not merely be acted upon. There was no one-way lecture to a disobedient child, as perhaps many of us might be inclined to deliver. Rather, the Father helped Adam as a learner to act as an agent and appropriately exercise his agency. Recall how Nephi desired to know about the things his father, Lehi, had seen in the vision of the tree of life. Interestingly, the Spirit of the Lord begins the tutorial with Nephi by asking the following question: “Behold, what desirest thou?” (1 Nephi 11:2). Clearly the Spirit knew what Nephi desired. So why ask the question? The Holy Ghost was helping Nephi to act in the learning process and not simply be acted upon. Notice in 1 Nephi 11–14 how the Spirit both asked questions and encouraged Nephi to “look” as active elements in the learning process. From these examples we recognize that as learners, you and I are to act and be doers of the word and not simply hearers who are only acted upon. Are you and I agents who act and seek learning by faith, or are we waiting to be taught and acted upon? Are the children, youth, and adults we serve acting and seeking to learn by faith, or are they waiting to be taught and acted upon? Are you and I encouraging and helping those we serve to seek learning by faith? We are all to be anxiously engaged in asking, seeking, and knocking (see 3 Nephi 14:7). A learner exercising agency by acting in accordance with correct principles opens his or her heart to the Holy Ghost and invites His teaching, testifying power, and confirming witness. Learning by faith requires spiritual, mental, and physical exertion and not just passive reception. It is in the sincerity and consistency of our faith-inspired action that we indicate to our Heavenly Father and His Son, Jesus Christ, our willingness to learn and receive instruction from the Holy Ghost. Thus, learning by faith involves the exercise of moral agency to act upon the assurance of things hoped for and invites the evidence of things not seen from the only true teacher, the Spirit of the Lord. Consider how missionaries help investigators to learn by faith. Making and keeping spiritual commitments, such as studying and praying about the Book of Mormon, attending Church meetings, and keeping the commandments, require an investigator to exercise faith and to act. One of the fundamental roles of a missionary is to help an investigator make and honor commitments—to act and learn by faith. Teaching, exhorting, and explaining, as important as they are, can never convey to an investigator a witness of the truthfulness of the restored gospel. Only as an investigator’s faith initiates action and opens the pathway to the heart can the Holy Ghost deliver a confirming witness. Missionaries obviously must learn to teach by the power of the Spirit. Of equal importance, however, is the responsibility missionaries have to help investigators learn by faith. The learning I am describing reaches far beyond mere cognitive comprehension and the retaining and recalling of information. The type of learning to which I am referring causes us to put off the natural man (see Mosiah 3:19), to change our hearts (see Mosiah 5:2), to be converted unto the Lord, and to never fall away (see Alma 23:6). Learning by faith requires both “the heart and a willing mind” (D&C 64:34). Learning by faith is the result of the Holy Ghost carrying the power of the word of God both unto and into the heart. Learning by faith cannot be transferred from an instructor to a student through a lecture, a demonstration, or an experiential exercise; rather, a student must exercise faith and act in order to obtain the knowledge for himself or herself. The young boy Joseph Smith instinctively understood what it meant to seek learning by faith. One of the most well-known episodes in the life of Joseph Smith was his reading of verses about prayer and faith in the book of James in the New Testament (see James 1:5–6). This text inspired Joseph to retire to a grove of trees near his home to pray and to seek for spiritual knowledge. Note the questions Joseph had formulated in his mind and felt in his heart—and which he took into the grove. He clearly had prepared himself to “ask in faith” (James 1:6) and to act. “My object in going to inquire of the Lord was to know which of all the sects was right, that I might know which to join. No sooner, therefore, did I get possession of myself, so as to be able to speak, than I asked the Personages who stood above me in the light, which of all the sects was right … and which I should join” (Joseph Smith—History 1:10, 18). Notice that Joseph’s questions focused not just on what he needed to know but also on what he needed to do. And his very first question centered on action and what was to be done! His prayer was not simply which church is right. His question was which church should he join. Joseph went to the grove to learn by faith. He was determined to act. Ultimately, the responsibility to learn by faith and apply spiritual truth rests upon each of us individually. This is an increasingly serious and important responsibility in the world in which we do now and will yet live. What, how, and when we learn is supported by—but is not dependent upon—an instructor, a method of presentation, or a specific topic or lesson format. The truths about learning by faith have profound implications for parents and teachers. Let us consider three of these implications. Implication 1. The Holy Ghost is a teacher from the Father. We should always remember that the Holy Ghost is the teacher who, through proper invitation, can enter into a learner’s heart. Indeed, you and I have the responsibility to preach the gospel by the Spirit, even the Comforter, as a prerequisite for the learning by faith that can be achieved only by and through the Holy Ghost (see D&C 50:14). In this regard, you and I are much like the long, thin strands of glass used to create the fiber-optic cables through which light signals are transmitted over long distances. Just as the glass in these cables must be pure to conduct the light efficiently and effectively, so we should become and remain worthy conduits through whom the Spirit of the Lord can operate. But we must be careful to remember in our service that we are conduits and channels; we are not the light. “For it is not ye that speak, but the Spirit of your Father which speaketh in you” (Matthew 10:20). It is never about me, and it is never about you. In fact, anything you or I do as instructors that knowingly and intentionally draws attention to self—in the messages we present, in the methods we use, or in our personal demeanor—is a form of priestcraft that inhibits the teaching effectiveness of the Holy Ghost. “Doth he preach it by the Spirit of truth or some other way? And if it be by some other way it is not of God” (D&C 50:17–18). Implication 2. We are most effective as instructors when we encourage and facilitate learning by faith. We are all familiar with the adage that giving a man a fish feeds him for one meal. Teaching the man to fish, on the other hand, feeds him for a lifetime. As parents and gospel instructors, you and I are not in the business of distributing fish; rather, our work is to help individuals learn to “fish” and to become spiritually self-reliant. This important objective is best accomplished as we encourage and facilitate learners acting in accordance with correct principles—as we help them to learn by doing. “If any man will do his will, he shall know of the doctrine, whether it be of God” (John 7:17). “Oh, if I could teach you this one principle. A testimony is to be found in the bearing of it! Somewhere in your quest for spiritual knowledge, there is that ‘leap of faith,’ as the philosophers call it. It is the moment when you have gone to the edge of the light and stepped into the darkness to discover that the way is lighted ahead for just a footstep or two. ‘The spirit of man,’ as the scripture says, indeed ‘is the candle of the Lord’ (Proverbs 20:27). I have observed a common characteristic among the instructors who have had the greatest influence in my life. They have helped me to seek learning by faith. They refused to give me easy answers to hard questions. In fact, they did not give me any answers at all. Rather, they pointed the way and helped me take the steps to find my own answers. I certainly did not always appreciate this approach, but experience has enabled me to understand that an answer given by another person usually is not remembered for very long, if remembered at all. But an answer we discover or obtain through the exercise of faith, typically, is retained for a lifetime. The most important learnings of life are caught—not taught. The spiritual understanding you and I have been blessed to receive, and which has been confirmed as true in our hearts, simply cannot be given to another person. The tuition of diligence and learning by faith must be paid to obtain and personally “own” such knowledge. Only in this way can what is known in the mind be transformed into what is felt in the heart. Only in this way can a person move beyond relying upon the spiritual knowledge and experience of others and claim those blessings for himself or herself. Only in this way can we be spiritually prepared for what is coming. We are to “seek learning, even by study and also by faith” (D&C 88:118). Implication 3. Our faith is strengthened as we help others seek learning by faith. The Holy Ghost, who can “teach [us] all things, and bring all things to [our] remembrance” (John 14:26), is eager to help us learn as we act and exercise faith in Jesus Christ. Interestingly, this divine learning assistance is perhaps never more apparent than when we are teaching, either at home or in Church assignments. As Paul made clear to the Romans, “Thou therefore which teachest another, teachest thou not thyself?” (Romans 2:21). “Teach ye diligently and my grace shall attend you, that you may be instructed more perfectly in theory, in principle, in doctrine, in the law of the gospel, in all things that pertain unto the kingdom of God, that are expedient for you to understand” (D&C 88:77–78; emphasis added). Consider that the blessings described in these scriptures are intended specifically for the teacher: “Teach … diligently and my grace shall attend you”—that you, the teacher, may be instructed! “Appoint among yourselves a teacher, and let not all be spokesmen at once; but let one speak at a time and let all listen unto his sayings, that when all have spoken that all may be edified of all, and that every man may have an equal privilege” (D&C 88:122; emphasis added). As all speak and as all listen in a dignified and orderly way, all are edified. The individual and collective exercise of faith in the Savior invites instruction and strength from the Spirit of the Lord. Please note how this inspired challenge is a classic example of learning by faith. First, you and I were not commanded, coerced, or required to read. Rather, we were invited to exercise our agency as agents and act in accordance with correct principles. President Hinckley, as an inspired teacher, encouraged us to act and not just be acted upon. Each of us, ultimately, had to decide if and how we would respond to the challenge—and if we would endure to the end of the task. Second, in proffering the invitation to read and to act, President Hinckley was encouraging each of us to seek learning by faith. No new study materials were distributed to members of the Church, and no additional lessons, classes, or programs were created by the Church. Each of us had our copy of the Book of Mormon, and a pathway into our heart opened wider through the exercise of our faith in the Savior as we responded to the First Presidency challenge. Thus, we were prepared to receive instruction from the only true teacher, the Holy Ghost. 1. Lectures on Faith (1985), 1. 2. See Boyd K. Packer, “The Candle of the Lord,” Tambuli, July 1983, 27; Ensign, Jan. 1983, 54. 3. History of the Church, 4:425. 4. History of the Church, 6:50. 5. The Articles of Faith (1924), 162. 6. In Junius F. Wells, “Historic Sketch of the YMMIA,” Improvement Era, June 1925, 715. 7. Tambuli, July 1983, 34; Ensign, Jan. 1983, 54–55. 8. “A Testimony Vibrant and True,” Liahona and Ensign, Aug. 2005, 6. ON THIS DAY IN 1829: Palmyra, New York. Egbert B. Grandin published the title page of the Book of Mormon as a “curiosity” in the Wayne Sentinel. he did put forth the stones into the vessels which were prepared, one in each end thereof; and behold, they did give light unto the vessels. I like to compare these two stones to the “Light of Christ” and the “Holy Ghost”. Every person in the world can receive “light” from these two sources, which have been “prepared” by the Lord for our benefit. thus the Lord caused stones to shine in darkness, to give light unto men, women, and children, that they might not cross the great waters in darkness. I have to do everything that I can to be prepared for life. they got aboard of their vessels or barges, and set forth into the sea, commending themselves unto the Lord their God. I imagine it took a LOT of faith in God to get on/in those barges. As we undertook this journey of life in these earthly vessels, I imagine it took a LOT of faith as well. Now, each day when we continue our journey we need to make sure that we are “commending” (entrusting) ourselves to God with the same kind of faith every day. After all, isn’t that what our Savior Jesus Christ did every day, even unto His final breath? “Father, into thy hands I commend my spirit.” (Luke 23:46) What would our days be like if our morning prayers reflected the same commitment and desire? Remember that when you feel like God is sending His furious wind, that it’s purpose is to move you “towards the promised land” of the Celestial Kingdom, not to blow you away. thus they were tossed upon the waves of the sea before the wind. Yes, there will be some “tossing” going on, but remember that the Lord has “prepared” you for it! You may get “sea sick” of it all, but He will never allow you to be tossed more than you can handle. they were many times buried in the depths of the sea, because of the mountain waves which broke upon them, and also the great and terrible tempests which were caused by the fierceness of the wind. Speaking to Noah, the Lord said, “Make thee an ark of gopher wood; rooms shalt thou make in the ark, and shalt pitch it within and without with pitch.” (Genesis 6:14) What is “pitch”? The word “pitch” in the original Hebrew translation of this passage is “kaphar” (verb), meaning: to cover, purge, make an atonement, make reconciliation. In other words, what gives us the ability to be “tight like unto a dish” and “like unto the ark of Noah” isn’t anything that we do for ourselves. It is conditional upon our willingness to “pitch” our lives “within and without with [the Atonement]”. If we do not “cover” ourselves with the Atonement, then when the wind blows, and the waves toss, and we are buried in the depths of the sea we will sink. therefore when they were encompassed about by many waters they did cry unto the Lord, and he did bring them forth again upon the top of the waters. See the explanation in the bullet-point above… Crying unto the Lord is one way that we can “kaphar”/cover ourselves with the Atonement. As we do so God will bring us “forth again upon the top of the waters”. Joseph Smith once said,“Never be discouraged. If I were sunk in the lowest pit of Nova Scotia, with the Rocky Mountains piled on me, I would hang on, exercise faith, and keep up good courage, and I would come out on top,” (The Sure Sound of the Trumpet) as he did over and over, again. God is mindful of me, and He will “never cease to blow [me] towards the promised land” of the Celestial Kingdom. he did thank and praise the Lord all the day long; and when the night came, they did not cease to praise the Lord. Not only would God not allow that which He had caused to happen to hurt the Jaredites, but He also would not allow outside factors of the environment in which they were placed to “break” nor “mar” them. Even so it is with us. As you are blown, and tossed, and buried by God on the way to the promised land of the Celestial Kingdom, you will also be attacked by the “monsters” and “whales” surround you in the environment in which God has placed you. He knows that they are there, and He has provided a way for you to be safe from them. they did have light continually, whether it was above the water or under the water. they did land upon the shore of the promised land. when they had set their feet upon the shores of the promised land they bowed themselves down upon the face of the land, and did humble themselves before the Lord, and did shed tears of joy before the Lord, because of the multitude of his tender mercies over them. And I imagine that is pretty much what you will see when/if you happen to see me arrive to our Celestial Home On High! Remember to LIKEN the scriptures as you study them. As you do so, the Lord will be able to help you through this journey of mortality and land you safely upon the shores of the promised land that He has prepared for you. So stop sitting on the beach! (Ether 2:14) Get on with your journey and “commend” yourself to God. Endure to the end and endure it well as He blows, and tosses, and buries you toward the promised land! ON THIS DAY IN 1829: Palmayra, New York. 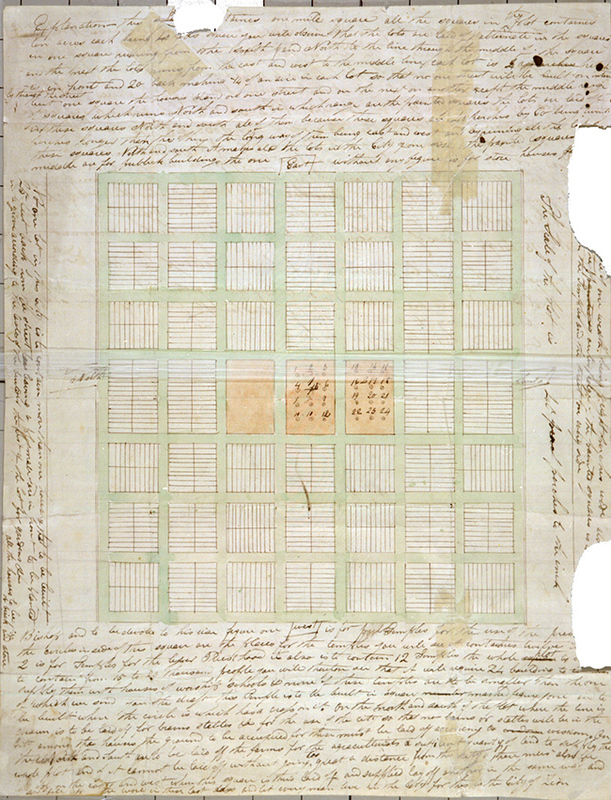 Joseph Smith showed the Eight Witnesses the gold plates near the Joseph Smith Sr. log home.